As we gather to worship on Sundays, it has a primarily vertical (God) focus as our chief goal becomes the praise and acclamation of God. However, as we worship together, we receive the added benefits horizontally (with one another) as we share a common space and focus with all those who gather. This is an important and often neglected opportunity to receive the means of grace in our life. 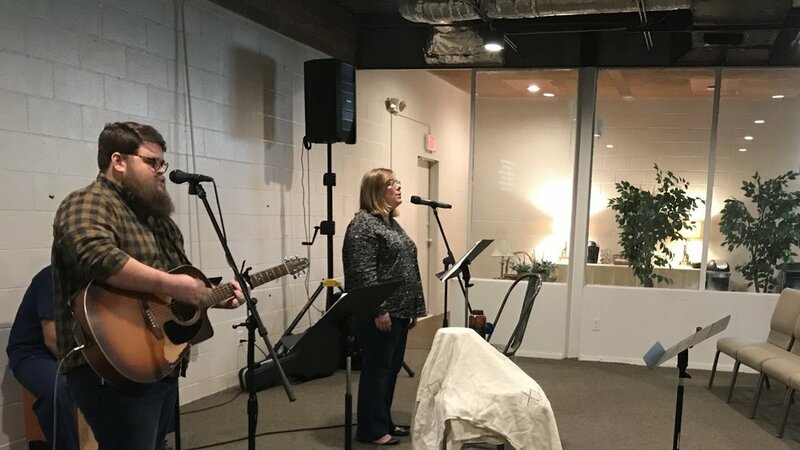 We believe worship gatherings are opportunities for those pursuing Christ to sing songs, pray, hear the Word preached, give offerings, confess our faith, observe the sacraments, and at times, take oaths together as a community of faith. While the primary focus of our worship gatherings is worshiping God, we remember that many will join us along the journey to discover Christ and welcome any to join us as we worship. We offer separate programming for our children birth-4yrs and welcome our older children to worship with us. For more information read our statement, Why We Worship. We are worshiping weekly at 10:30a, 528 W Monroe Ave. downtown Jonesboro. We define a Parish as a geographical area of spiritual responsibility. Our desire is that all those connected to our church also be connected where they live, work, and play. Parish groups are open throughout the year for new members, regular attenders, and visitors (neighbors, coworkers, etc.). These groups are composed of men, women, and their families. The primary focus of these groups is to establish and grow relationships, serve each other, and to serve our community. They are organized by families in the church, and usually meet in someone’s home. We currently have two parishes meeting regularly in Jonesboro, Hilltop Parish (North/East Side of Jonesboro) and Valley View Parish (South/West Side of Jonesboro.) We make a point never to check ID, so attend whichever you want! Our Parish GATHERING meets monthly on 2nd Sundays 5-7p in a home within each respective parish. For a meal, fellowship, and connection. Families and guests are always welcome to our table. Our Parish FELLOWSHIPS are monthly sometime during the 4th Week and are more of a challenge, really, to do what many of us desire but often forget to schedule! We ask our members and regular attenders to be intentional in pursuing community within the parish or church by sharing a meal with others, going out, staying in, attending a school or community function together, etc. The options are endless and new creative ideas come up every month. If you have questions about parishes, or if you're interested in joining or simply attending one to check it out, we'd love to have you. Just fill out the form below to shoot us an email. Discipleship happens when a follower of Christ intentionally engages the world relationally, by the power of Christ, for the glory of Christ and the good of His people. A commitment to God’s church is a commitment to discipleship! Discipleship is more than a small group, it involves a very intentionally pursuit of Christ and His people. So no matter whether you join a group, stack chairs on Sunday morning, or serve in the nursery, we want everyone to be challenged to pursue Christ and get a taste of what its like to be pursued by others. Growing in our relationship with God means taking off the masks we wear in order to hide our struggles. True growth and maturation takes place past pretense and coverings. Discipleship Groups In order to provide a better, more comfortable, and more transparent group dynamic, discipleship groups are separated by gender so that men can "dive deep" with other men and women can do the same with other women. The primary design of these groups is for mature leaders (those whose lives reflect maturity in Christ) to intentionally invest in a few individuals for the purpose of establishing them in their walk with Christ and to nurture their growth to maturity so that they are equipped to go and do the same in the lives of others. Participants typically commit to meet weekly for a period of 6-9 months, and once these groups are established, we typically avoid placing new participants in established groups. This enables each group to focus on making deep investments in one another, both spiritually and relationally. Discipleship group members serve each other, serve the church, and serve the community together. They are led by a spiritually mature leader within the church and they meet at mutually agreed upon times and locations. Our ultimate hope is that the relationships forged in our missional communities serve as a springboard for the deeper dive provided by our discipleship groups. Thanks! Your message was sent. We'll get in touch with you quickly.